On Saint Faustina’s road of life there are villages, towns, cities, the most important places where the Apostle of the Divine Mercy stayed. They are frequented by pilgrims who come there in order to touch the places marked by her presence as well as to meet the Saint, learn about her experience of God and about the example of her life. The village of Głogowiec is situated near Łęczyca, the parish in Świnice Warckie, on the borderline between Greater Poland and Mazovia regions. It is there that Marianna and Stanisław Kowalski bought a few acres of farmland from the Olejniczaks and, in 1900, they built a modest, one-storey house and farm buildings of Różniatowski stone [kind of limestone], which is characteristic of this area. The house consisted of only one room, hall and kitchen, which was also the carpenter’s workshop of the father in winter. This house was small, cramped. Still, it was a place that belonged to the family and it was there that ten children were born, including the Prophet of our times who revealed the message of Mercy to the world. The Kowalskis supported themselves on a small farm and on the father’s carpentry skills. Although at home they lived very modestly and there was not enough money for many things, still it sufficed to buy what was necessary for spiritual life: in the room at the main place there was a little altar with the Passion scene and faience statuettes of the Heart of Jesus and Mary. Holy pictures hung on the walls and there was also a small collection of religious books. God was most important there, which was expressed by not only the decoration of the house but, above all, by the family’s everyday life: by prayer, work and the parents’ testimony of life. This was the atmosphere in which Helenka Kowalska grew up. At home she learnt not only to work but also and maybe above all, to believe, love God and neighbour. Today Saint Faustina’s family house belongs to the parish. It has been converted into a museum in which there are things that are to show the atmosphere of the times and the life of the Kowalski’s family. The farm buildings and the area surrounding the house have been adapted for pilgrims’ needs. From Głogowiec to the parish church in Świnice Warckie there is about two kilometres. 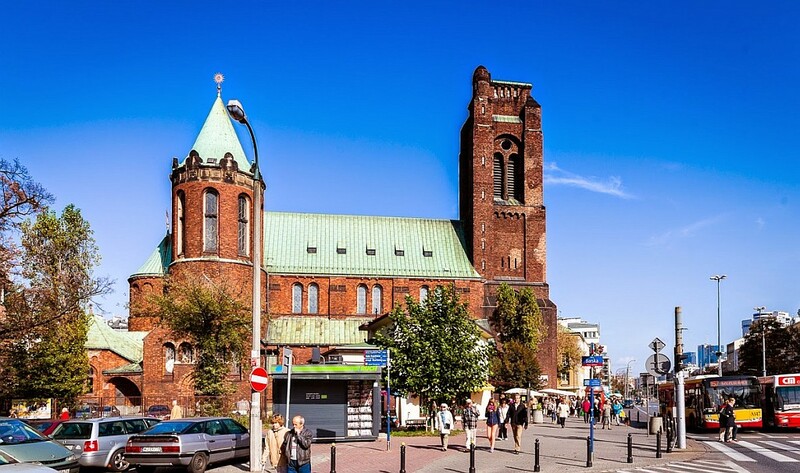 It is an old parish which was established over 700 years ago by the Archbishop of Gniezno, Jakub Świnka, one of the most prominent figures of the Middle Ages who founded the whole village and the first church there. During the regional partition he became famous as a defender of the Polish identity; he instructed the clergy to deliver sermons and pray with the people in the mother tongue. The first reference of Świnice dates back to the year 1301. The village situated close to trade routes must have been developing fairly rapidly because as early as in 1458 it was called a city. Its coat of arms was the one of Jakub Świnka’s family and it was known in many European countries: there is a girl’s hand in a wild boar’s jaws on it. Legend has it that the girl was a Sarmatian who was sentenced to death in Rome – she was to be devoured by the beast because of her Christian faith. However, she tore apart the wild boar’s jaws and she saved her life in this manner. Apart from this note Świnice has always been referred to as a village. In the 19th century the second element ‚Warckie’ was added to the name – due to the fact that the village was close the Warta River and that it was part of the Warcki district. Until the beginning of the 16th century the village belonged to the archbishops of Gniezno and later it was owned by a few families, including the Byszewskis, the Umińskis, the Świnickis and the Zarębas. The first wooden church, St Gotthard’s one, was probably built as early as in the year 1300; it was founded by Archbishop Jakub Świnka. In 1592 it was replaced with a new one, which was also wooden, and in 1828 a third church was built. However, a few days after it was consecrated it burnt down along with the presbytery, belfry and shelter for the elderly and the outbuildings. Since that time for 30 years Świnice was part of the neighbouring parish and there was only a small chapel in place of the former church. The present St Casimir the Prince’s Church, founded by the then owner of Świnice, Kazimierz Karwowski, and the parishioners, dates from 1859. In the presbytery and in the one-nave interior of the church there are three baroque altars. Today in the high altar there is the image of the Merciful Jesus (gift of the ‚Faustinum’ Association). It has replaced the image of Our Lady of Częstochowa, which was moved to the left side altar. A picture of Saint Faustina was put in the side altar on the right and the image of the patron saint of the church, Saint Casimir, was moved to the upper part of the above-mentioned altar. Next to this altar there is Saint Faustina’s ornamented reliquary and the font in which she was baptized. In this church Helenka Kowalska prayed, attended the Eucharist, services during which the Blessed Sacrament was exposed and she also went to confession. There is still the confessional – the silent witness to her meetings with God when she was a child, during the Sacrament of Mercy. When she was seven, at vespers, for the first time she experienced God’s merciful love tangibly. It was at this church and, years later, she interpreted the experience as a call to serve God. When she was a nun and she was visiting her mother, who was seriously ill at that time, she also came to this church. In the ‚Diary’ she wrote: ‚How easy it was to pray in that little church! I remembered all the graces that I had received there, and which I had not understood at the time and had so often abused. I wondered how I could have been so blind. And as I was thus regretting my blindness, I suddenly saw the Lord Jesus, radiant with unspeakable beauty, and He said to me with kindness: My chosen one, I will give you even greater graces that you may be the witness of My infinite mercy throughout all eternity’ (Diary 400). After Sister Faustina’s was beatified and canonized more people took an interest in her homeland. On the 25th September, 2002, the ordinary of Włocławek, Bishop Bronisław Dembowski, raised the parish church to the rank of the diocesan shrine of Saint Faustina’a baptism and birth. In 2005 the church started to be extended. Close to it, the Congregation of the Sisters of Our Lady of Mercy built a contemplative convent in order that the desire to preach to the world the message of God’s merciful love for man, by prayer and sacrifice, be fulfilled in it. Sr M. Elizabeth Siepak O.L.M. ‚Divine Mercy Newsletter’, no. 61 (2007), pp 10-11. The area around the town boasts fairly long and interesting history, and even prehistory, dating back to about 6000 years B.C., which is shown by archaeologists’ discoveries. We are interested in the foundation of the town itself as well as in its life at the beginning of the 20th century because it was precisely then that Helena Kowalska stayed there. Rafał Bratoszewski, a Polish nobleman who belonged to the clan of Sulima, was the founder of the town. Around 1798 he bought some land in Brużyca Wielka, nearby Zgierz, and around 1816, on the hill near the route Zgierz-Lutomiersk – the infertile, sandy part of the estate with few forestshe decided to found a new settlement. It was to be a town geared to produce woollen fabrics. Bernard von Schuttenbach, an Austrian who was hired by the founder, drew up the architectural design for the weaving settlement: a spacious market square with the town hall and churches as well as a network of perpendicular streets with one-storey wooden houses for weavers. In the same year a Catholic church started to be built. Because of the patron saint of Rafał Bartoszewski, who founded the church and the settlement, the church was dedicated to Saint Raphael the Archangel. It was finished two years later and then the town hall as well as, gradually, other public facilities (shambles) was built. A protestant church was also erected because many German settlers who were of the Evangelical denomination came to Alaksandrów. A number of Jews settled there, too. On the 22nd March, 1822, the Administrative Council of the Kingdom of Poland granted the settlement a town charter and named it ‚Aleksandrów’ in honour of the then Russian Tzar, Alexander I – the king of Poland and the vanquisher of Napoleon. The fact that the settlement was granted a town charter and a coat of arms (the letter ‚A’ on a wall = Alexander’s town) made Aleksandrów more significant. The settlement was developing extremely rapidly (more than Łódź and Zgierz) – as a centre of the weaving industry and an impressive amount of cloth was produced in it. The army and local population supplied themselves with the cloth and significant amount of it was also exported. At the beginning of the 19th century over 200 cloth makers, dyers, producers of canvas and ribbon worked in home workshops in Aleksandrów. After the death of Rafał Bratoszewski (1824), thanks to the marriage of his only daughter – Julia, the Kossowskis family, who belonged to the noble clan of Dołęga, became the owner of Aleksandrów. However, the family did not care about the good of the city, did not invest in its development, but rather tried to reap as much profit as possible from it. Historical events, the fact that the inhabitants of Aleksandrów were engaged in the November and January Uprisings, contributed to the gradual downfall of the town, which, consequently made Aleksandrów lose its town charter in 1869. When Helenka Kowalska came to Aleksandrów, it had over 8200 inhabitants, including 34% of the Poles, who were Catholics, 37% of the Germans – mostly Protestants and 29% of Jews, who had an important religious centre with a seat of Hasidic rabbis – tzadiks – in the town. After the charter was revoked, the settlement remained not so much a centre of the weaving industry any more – it was rather a centre of knitting and hosiery. Since the town was founded it was referred to as ‚Aleksandrów Fabryczny’ or ‚Aleksandrów Łęczycki’ and, in 1924, when it was regranted the town charter, its name was changed into ‚Aleksandrów Łódzki’, which is also its present one. 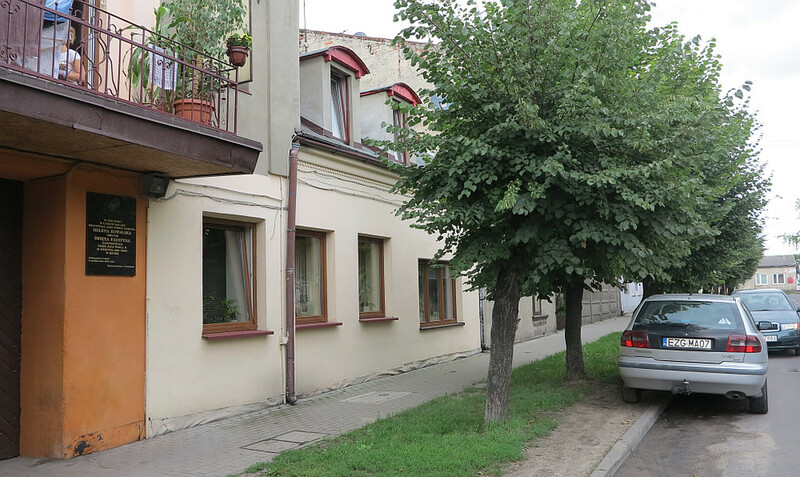 The Bryszewskis bought a property close to the market, at 30 Parzęczewska Street (today at 7 1 Maja Street) and they had a new house built. On the ground floor, facing the street, there was a bakery shop and in the yard there was their bakery, where they employed a few people. Close to the house there was also a small garden where the second part of the building was constructed later on. In 1915 their only son, Zenon, was born so they needed someone to help them run the house and take care of the child. In 1921 Helenka Kowalska came to them on the recommendation of Janina Ługowska – it was Mrs Bryszewska’s sister and she knew the Kowalski’ family well because, together with her husband, she lived in Rogów, which was adjacent to Głogów. Years later Zenon Bryszewski recalled: ‚In the shop mum served customers and Helenka cleaned, helped cook, she had to wash up, carry out the refuse and bring water because there was no water supply system. She also served food to the employees of the bakery, who were provided with meals by my parents and, if time allowed, she played with me. She must have had a lot of work because in the house there were four rooms and there was also the shop and the bakery.’ The little Zenon waited for Helenka to have free time – he liked when she told him various fairytales and true-life stories, for instance, about a squire who, after his death, was coming to people and was seen by them. – She sat down on a couch where she slept – it was in the kitchen, under a window. She sat the Bryszewskis’ son on her lap or he sat on a small chair next to her and they talked. Or rather it was Helenka who told Zenek about something and he listened to her contentedly. In the evening everybody knelt down to pray and in October they said the Rosary – it was a must. On Sundays and days of feasts they went to St Raphael’s church, which, at that time, had only one nave and no tower. Most probably it was at this church that Helenka Kowalska received the sacrament of confirmation – at that time the bishop visited the parish and, on this occasion, he conferred the sacrament of Christian maturity. Helenka lived at the Bryszewskis’ for one year. There is one important event connected with her stay there, which had a considerable impact on the maturing of her religious vocation: one day she saw a great light through a window in the kitchen overlooking the bakery. Level-headedly, she thought that there was a fire and, just when the bakers put loaves of bread into the oven, she started screaming. The employees run out but it was a false alarm – there was no fire in the yard. However, Helenka experienced that strongly, it was necessary to call a doctor and then let her parents know about what had happened. Worried, the Kowalskis sent the eldest daughter, Józefa, to get to know something more about what had happened. When asked, Helenka briefly said that she had seen a light but she did not want to say anything more. She just asked her sister to tell the parents that she was not stupid and that she would not stay in that house for a long time. Indeed, soon after the event she left Aleksandrów and came back to Głogowiec in order to ask permission from her parents to enter a convent. On the 27 September, 1993 – a few months after Sister Faustina’s beatification, a plaque commemorating Helenka Kowalska’s stay at the Bryszewskis’ place, funded by the parish priest and worshippers, was put on the house. ‚Divine Mercy Newsletter’, no. 62 (2007), pp 10-11. Helenka Kowalska came to Ostrówek in July, 1924. She stayed at the Lipszycs’ house, where she worked as a domestic. It was the place from which she set off to search a convent in Warsaw. It was also there that, for a year, she earned money which she saved for a modest trousseau. Mrs Aldona Lipszyc recalled that Helenka, who worked there for one year, carried out her duties excellently and that she was treated as a family member. Therefore, it was so hard to part with her when she stopped working there. At this home she was always associated with the hymn ‚I am to revere Jesus hidden in the Sacrament’ – she had frequently sung it. Helenka attended Holy Mass and services in the parish church in Klembów where, in June 1925, she made a private vow of chastity. In the ‚Diary’ she described the event in the following way: ‚It was during the octave of Corpus Christi, God filled my soul with the interior light of a deeper knowledge of Him as Supreme Goodness and Supreme Beauty. I came to know how very much God loves me. Eternal is His love for me. It was at vespers. In simple words, which flowed from the heart, I made to God a vow of perpetual chastity. From that moment I felt a greater intimacy with God, my Spouse. From that moment I set up a little cell in my heart where I always kept company with Jesus’ (Diary16). The church which remembers the event dates from the first half of the 19th century. 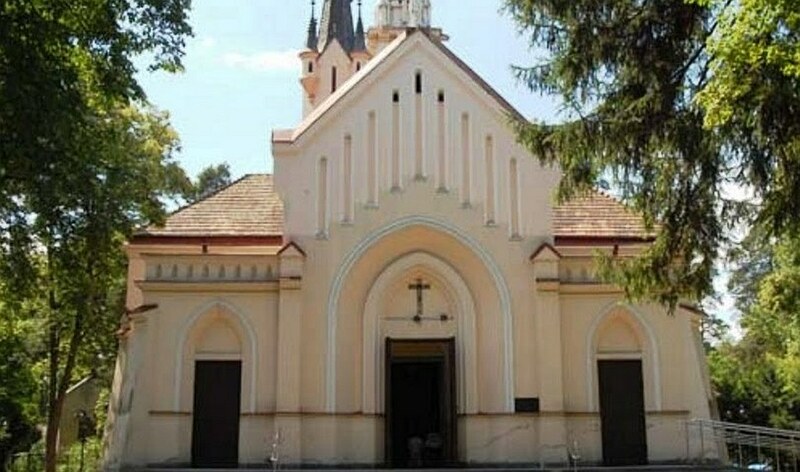 In 1823-1829 general Franciszek Żymierski, the owner of Klembów lands, had the church constructed – it was built in the neoclassical style in place of a temple which had been burnt during the Kościuszko Uprising. The first wooden St Clement’s Church dated back to the 14th century when Klembów belonged to Dukes of Mazovia. Since 1862 there was a railway station at the Warsaw-Petersburg line. The village of Ostrówek is the biggest place in Klembów County (it is in Mazovia Province, Wołomin District). The village is 36 km from Warsaw and it is situated in Wołomin Plain, Warsaw Basin, Mazovian Lowlands. It is surrounded by forests where the oak reserve ‚Dębina’ is. Ostrówek used to be part of St Clement’s parish in Klembów. However, now it has its own parish and church dedicated to the Most Blessed Virgin Mary, the Mother of Church, which was built in 1982-1985. One could even show the Apostle of the Divine Mercy’s path in this city – not only the convent of the Congregation of the Sisters of Our Lady of Mercy in Żytnia Street and the former chapel of the Congregation, which is the parish of the Divine Mercy and St Faustina today, but also other places are connected with her stay in the capital. The former railway station – Warszawa Główna, which is the Railway Museum today (1 Towarowa Street) was the first place touched by the Saint’s feet in Warsaw. In the museum, among other things, old timetables have been preserved and one can check the arrivals of trains from Łódź. There were a few of them a day because the trains connected a big industrial centre – Łódź – with the capital of the country. Everything suggests that in 1924 Helenka Kowalska came to Warsaw by the train which was scheduled to arrive at the railway station Warszawa Główna at 5.35 pm. She seems to confirm it when, in the ‚Diary’, she writes: ‚When I got off the train and saw that all were going their separate ways, I was overcome with fear. What am I to do? To whom should I turn, as I know no one? So I said to the Mother of God: „Mary, lead me, guide me.” Immediately I heard these words within me telling me to leave the town and to go to a nearby village where I would find a safe lodging for the night. I did so and found, in fact, that everything was just as the Mother of God told me’ (Diary 11). It must have been in the evening as the Mother of God told her to go to the village where she would find a safe lodging for the night. In the ‚Diary’ she wrote: ‚Very early the next day, I rode back into the city and entered the first church I saw. There I began to pray to know further the will of God. Holy Masses were being celebrated one after another. During one of them I heard the words: „Go to that priest and tell him everything; he will tell you what to do next.” After the Mass I went to the sacristy. I told the priest all that had taken place in my soul, and I asked him to advise me where to take the veil, in which religious order.’ (Diary 12). Rev. James Dąbrowski was this priest. He had worked in Klembów and was a friend of the Lipszycs family, who lived in Ostrówek. During the conversation with Helenka Kowalska he advised her to stay precisely at the Lipszycs, who needed someone to help them take care of the children. It was the place from which she set off to search a convent. He gave her a note for the acquaintances, saying: ‚I don’t know her but I hope she would be all right’. At that time the construction of St James Church at 38 Grójecka Street in Ochota, a suburb of Warsaw, was in its first stage. – The church, with a characteristic tower with a square base, designed by Oskar Sosnowski, started to be built in 1918, after Archbishop Aleksander Kakowski had erected the parish. 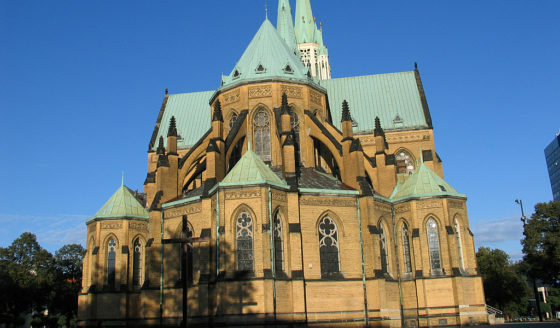 The construction was finished in 1939 and the neoromanesque church has one nave and two aisles. At the end of the aisles there are two chapels: one is dedicated to Our Lady and the other to the Blessed Sacrament. During the Warsaw Uprising the church was considerably damaged and during a bombardment the first parish priest, Rev. Jakub Dąbrowski, was killed. After the war the church was rebuilt and it was consecrated by Cardinal Stefan Wyszyński (1960). In 1924, in July, Helenka Kowalska came to the convent of the Congregation of the Sisters of Our Lady of Mercy in Żytnia Street and, having spoken with the superior of the house, Mother Michael Moraczewska, she was initially admitted to the congregation. However, due to lack of a trousseau, for one year she continued in service at the Lipszycs in Ostrówek. On the 1st August, 1925, she entered the enclosure in this house. It was the cradle of the Congregation because it was there that Mother Teresa Ewa Countess Potocka, neé Sułkowska – who was a family of princes – founded the first Mercy House, which was blessed by Archbishop Zygmunt Szczęsny Feliński on the 1st November, 1862. In this convent Sister Faustina spent a part of postulancy and juniorate and it was there that she had the third probation. She stayed at this convent when she changed places of residence or when she came to converse with the general superior. At first there was a wooden chapel in the convent, however, soon it turned out to be too small for the sisters and wards. Therefore, a bigger one, made of brick, was built and it was blessed on the 8th of December, 1873. It was precisely this chapel that Helena Kowalska went to in order to ask the Lord of the house whether He would accept her. As early as during Saint Faustina’s lifetime, before the Second World War, the chapel was rebuilt thoroughly and on the 6th of August, 1938, it was reconsecrated by Bishop Stanisław Gall. In 1942 an image of the Merciful Jesus painted by Stanisław Batowski was hung in the chapel. During the war the sisters helped civilians, also those of Jewish descent. They had many opportunities to do so because the convent was in the vicinity of the Ghetto. After the failure of the Warsaw Uprising in Wola [a district of Warsaw] the sisters and wards were taken to camps and the Germans burnt the convent as well as the chapel to the ground. In the post-war period for many years the communist authorities did not consent to the rebuilding of the chapel and of the first convent of the Congregation of Our Lady of Mercy in Poland. By the Act of the 15th December, 1980, Cardinal Stefan Wyszyński erected a Divine Mercy parish. He allotted the former chapel of the Congregation of the Sisters of Our Lady of Mercy to it – the chapel was to be the parish church. In 1998 the name of Blessed, and later, Saint Faustina was added to the name of the parish. In the presbytery of the church there is an image of the Merciful Jesus which visited all parishes of the Archdiocese of Warsaw before the Great Jubilee of the year 2000. The sisters also rebuilt their convent, which still performs the function of the general house of the Congregation and a formation house of the postulancy. In 1929 Sister Faustina was sent to the second house of the Congregation in Warsaw, which was being created at that time. It was in the Grochów district, at 44 Hetmańska Street – thinking about the recreation of sisters and girls from the institute in Żytnia Street, the Congregation bought a two-hectare plot of land in Grochów, which was on the outskirts of Warsaw at that time. In 1927 a makeshift house (shack) was built and, later, a garden and a greenhouse were added – with the help of the local population, including the closest neighbour, Antoni Dobraczyński. At first, only a few sisters lived in the house in Grochów permanently, while other sisters as well as girls stayed there temporarily. In 1929, in June, Sister Faustina was assigned to work there. She had just finished substituting for a sister working in the kitchen in the house of the Congregation in Vilnius. However, she was not in Grochów for a long time because as early as on the 7th July that year she was sent to a house of the Congregation in Kiekrz in order to substitute for an ailing sister in the kitchen. Although her stay in the house was so short, she had enough time to win the wards’ hearts, who promised that they would follow her to the next house she would live in. 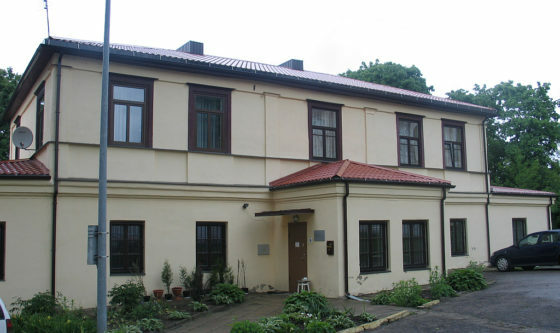 In the ‚Diary’ Sister Faustina also describes a small episode connected with a recreational trip to this house from the convent in Żytnia Street. It was on Christmas Day (Diary 42). Now in Hetmańska Street in Grochów the sisters run a big social welfare home for women who are lonely and elderly. In the monastic chapel there is an image of the Merciful Jesus which was painted by Ludomir Ślędziński in 1954 and which won a contest organized by Rev. Michael Sopoćko. Public devotion to the image has been accepted by the Polish Episcopal Conference. In the chapel of the social welfare home an image of Saint Faustina was hung. It had been painted by Helena Tchórzewska and used during the ceremonies for beatification and, later, canonization of Saint Faustina. 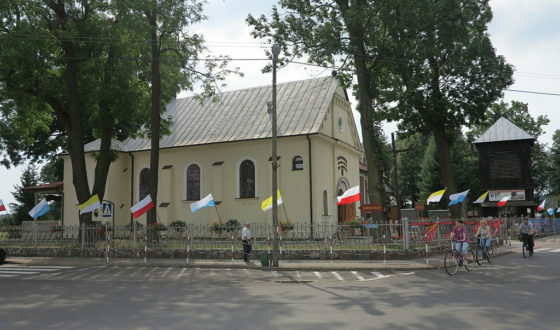 In the close vicinity of the Congregation of the Sisters of Our Lady of Mercy at 3/9 Żytnia Street there is a property of the Congregation of the Sisters of the Family of Mary (entrance from Żelazna Street) along with a chapel who one can enter from Żytnia Street. Saint Faustina prayed in the chapel at least once. It was in 1932 when she came to Warsaw for her third probation before perpetual vows. For a year and a half Jesus had been conveying the great mission of Mercy to her: He had been telling her to have the image painted and the Feast of Mercy instituted in the whole Church. Sister Faustina, who had been carrying out duties of a cook in the convent so far, felt that she was incapable to fulfil the tasks; therefore, she wanted to shrink from them. 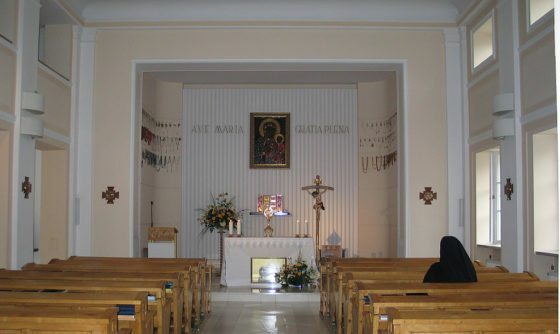 In the ‚Diary’ she related her stay in the chapel of the Sisters of the Family of Mary: ‚Once, when there was adoration at the convent of the Sisters of the Holy Family, I went there in the evening with one of our sisters. As soon as I entered the chapel, the presence of God filled my soul. I prayed as I do at certain times, without saying a word. Suddenly, I saw the Lord, who said to me: „Know that if you neglect the matter of painting of the image and the whole work of mercy, you will have to answer for a multitude of souls on the Day of Judgment.” After these words of Our Lord, a certain fear filled my soul, and alarm took hold of me. Try as I would, I could not calm myself. These words kept resounding in my ears: So, I will not only have to answer for myself on the Day of Judgment, but also for the souls of others. These words cut deep into my heart. When I returned home (…) I fell on my face before the Blessed Sacrament and said to the Lord: „I will do everything in my power, but I beg You to be always with me and to give me strength to do Your holy will; for You can do everything, while I can do nothing of myself.”‚ (Diary 154). ‚Divine Mercy Newsletter’, no. 65 (2001), pp 10-11. 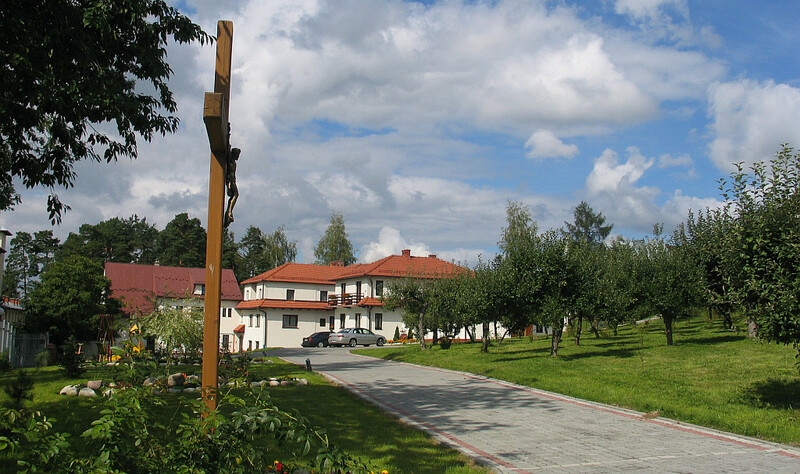 Sister Faustina stayed in this village near Warsaw when she was a postulant – she was there during the first period of her stay in the Congregation. Toward the end of August, 1925, the superiors sent her with two other sisters for a short time there – in order to recuperate – in the village the Congregation rented a villa – a vacation house for the sisters and wards. Today it is hard to locate the house where Sister Faustina stayed; however, the parish church remembers her presence because she participated in the daily Eucharist there. Sister Faustina – who was still Helena Kowalska at that time-, remembered that during her stay in Skolimów she had had a vision of purgatory which she described in the ‚Diary’ (Diary 20). Skolimów used to be a knights village which dated back to the 15th century. At present it is a district of Konstancin-Jeziorna in Mazovia province, Piaseczno district. The village, where beautiful villas were built on plots of forest land, in sandy streets and among trees, used to be a holiday place. At the beginning of the 20th century (1903) Our Lady of Angels’ Church was also built. It was funded by the owners of the neighbouring villas: not only by Catholics, but also by Evangelicals and Jews. Following Saint Faustina, we are going to Płock, to the city where her great, prophetic mission began. She came to the convent of the Congregation of the Sisters of Our Lady of Mercy at 14/18 Stary Rynek in May or June, 1930. It is there that the sisters ran the ‚Guardian Angel’ Institute, which was famous in the city, and it is there that they brought up ‚fallen’, as it was said at that time, girls. 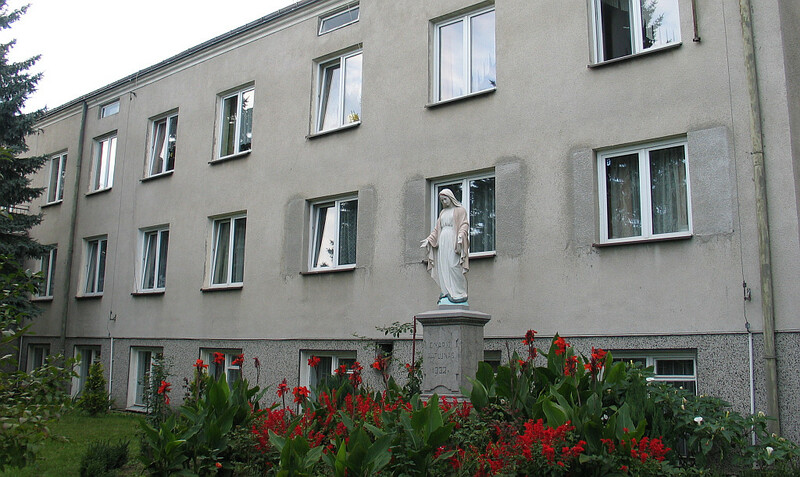 The beginnings of the ministry of mercy at that place are connected with Mother Kolumba Łabanowska and the Blessed Bishop Antoni Julian Nowowiejski. The latter, when only a priest, founded an institute for poor girls as well as the Congregation of the Divine Love which was to educate the girls and whose members did not wear habits. In 1899 that Institute joined the Congregation of the Sisters of Our Lady of Mercy, which had experience in such apostolic work and since that time the ‚Guardian Angel’ Institute was developing well. At first about 50 penitent girls and women stayed in it and when a branch of the house, in Biała, a village near Płock, was opened – even over 100 wards. Depending on their abilities, under the sisters’ direction, they worked in the laundry, sewing or embroidery rooms or on the farm in Biała. The life of the sisters and the wards concentrated on prayer and work, which was not only the main source of income of the institute but it was also an important means to educate girls and prepare them for decent life in society. The institute commanded the respect of the Church, city authorities and inhabitants of Płock. Archbishop Julian Nowowiejski was a great protector and friend of the house, which, for instance, his book entitled ‚History of the Institute of Our Lady of Mercy’ proves. In 1918 the convent and the ‚Guardian Angel’ Institute in Stary Rynek was visited by Rev. Achille Ratti, who was later to become Pope Pius XI. Mother General, Michael, sent Sister Faustina to this convent – she assigned her to work in the baker’s shop. She explained Sister Faustina’s frequent moves in the following way: ‚Things turned out in such a way that it was necessary to transfer Sister Faustina to various places frequently, so she worked almost in all the houses of the Congregation and after the short stay in Warsaw in Żytnia Street and in the Grochów district she was moved again – to Płock. From that place, for a short period of time, she was transferred to Biała, an agricultural colony of the Płock house. However, her main job in Płock consisted in working in a shop – she sold baked goods from a local bakery until her third probation.’ Every day in this shop many inhabitants of Płock bought baked goods. They were served by Sister Faustina, who did it in an extremely friendly manner. Many years later some of them recalled good rolls and bread handed by the good Sister. When it was necessary, Sister Faustina also substituted for sisters working in the kitchen or bakery – it is written in their memoirs. 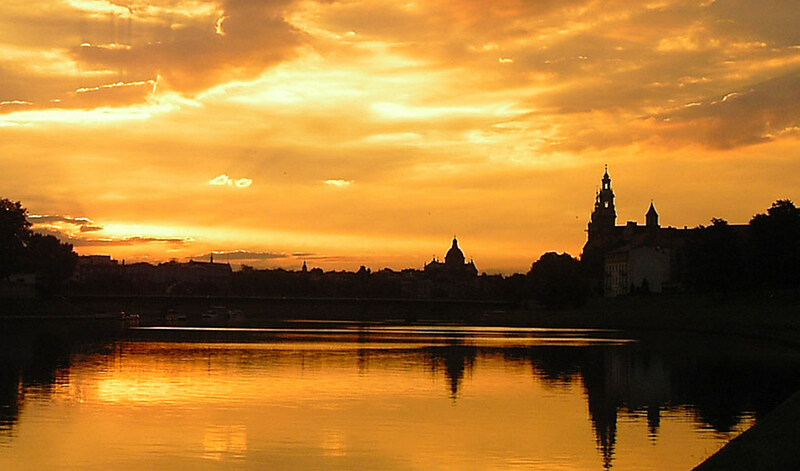 The convent of the Congregation is situated on the river Vistula, in the old part of the city. Płock has a very rich history which dates back to the 10th – 11th century because it was already then that a wooden fortified settlement – an early Piast dynasty administrative centre – was built. In 1075 the diocese of Płock was erected and in 1144 the cathedral, in which rulers of Poland: Władysław Herman and Bolesław Wrymouth are buried, was built. In the cathedral porch there is a replica of the famous bronze Door of Płock, which was made in Magdebourg in 1154. The walls of a ducal castle dating back to the 14th century as well as a Benedictine abbey tell about the history of the city. In the Market Place and in old streets there are many historic tenements. There is also an elegant town hall, in which in 1831 there was the last session of the Sejm [the supreme legislative body] of the Kingdom of Poland, and which has been the seat of the city authorities. The parish church – St Bartholomew’s – which dates back to 1356, is also of Gothic origin. 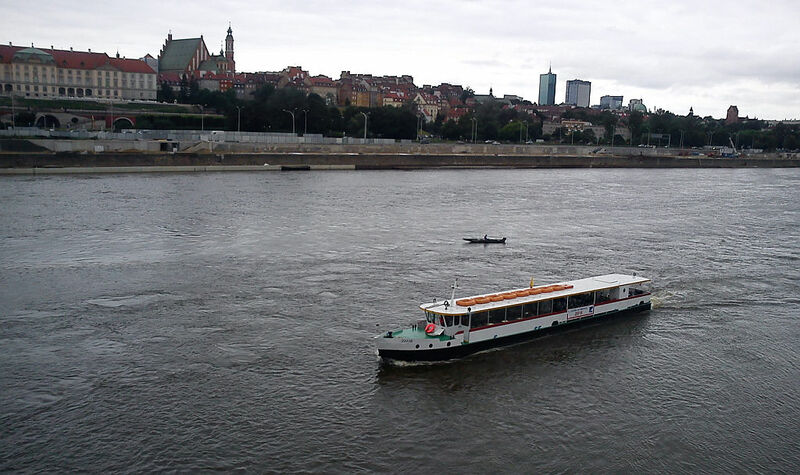 It has been rebuilt a number of times and, after the river bank subsided and the church partially fell down into Vistula, its body was shortened and a baroque entrance from the Market was added. One can suppose that Saint Faustina was also in these places in Płock because the sisters from the house in Stary Rynek took part in solemnities in the cathedral or in their parish church – St Bartholomew’s one. Through the windows in her room she looked at the famous ‚Małachowianka’ – the oldest existent high school in Poland, which was founded in 1180. In the basement of the medieval wing of the building there is a school museum, whose architecture is partially in the Romanesque and Gothic styles. There is also an observatory – in the Gothic tower of the school. 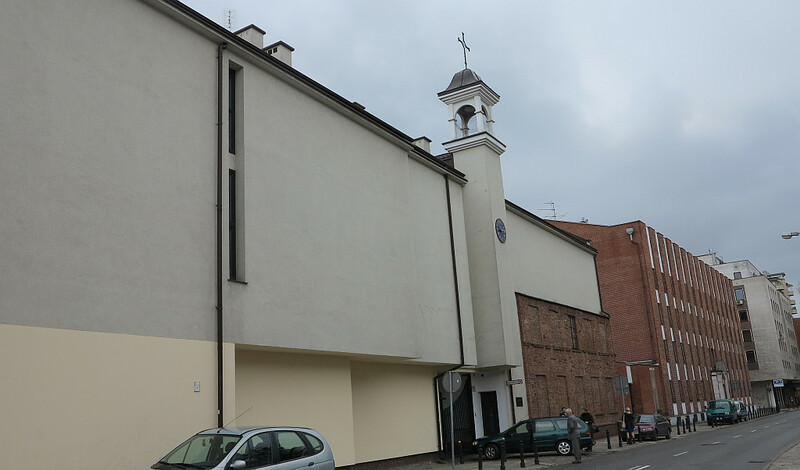 It was in this city, in the convent in Stary Rynek that an event of historic importance to the Divine Mercy worship took place: the first revelation of the Merciful Jesus, which started Sister Faustina’s public mission. She wrote about this in her ‚Diary’: ‚In the evening, when I was in my cell, I saw the Lord Jesus clothed in a white garment. One hand [was] raised in the gesture of blessing, the other was touching the garment at the breast. From beneath the garment, slightly drawn aside at the breast, there were emanating two large rays, one red, the other pale. In silence I kept my gaze fixed on the Lord; my soul was struck with awe, but also with great joy. After a while, Jesus said to me: „Paint an image according to the pattern you see, with the signature: Jesus, I trust in You. I desire that this image be venerated, first in your chapel, and [then] throughout the world. I promise that the soul that will venerate this image will not perish. I also promise victory over [its] enemies already here on earth, especially at the hour of death. I Myself will defend it as My own glory”‚ (Diary 47-48). A statue of the Merciful Jesus commemorates the event – it is in place of the former dormitory where sisters used to live. There – in this yard – one can also go down to a museum which the sisters established in the basement. The museum depicts the history of the house in Płock, its life and work – by real photos, exhibits and, above all, the real bakery, where Saint Faustina dropped by and where sometimes she must have worked. It was also in the convent in Płock that Sister Faustina heard Jesus’ order to have the Feast of Mercy instituted on the first Sunday after Easter. Thanks to her biography and ‚Diary’ we know how much effort she had to make and how much she had to suffer in order to carry out this and other directives of Jesus faithfully. However, it was in this convent that the ‚luminous trail’ commenced – the trail on which Jesus gradually conveyed to her the prophetic mission of reminding the world about His merciful love for every person. In 1950 the communist authorities deported the sisters from the convent in Płock to its branch in Biała and they nationalised the convent as well as ‚Guardian Angel’ institute. The historic building fell into ruin and, after 40 years, returned to the Congregation, which, with the help of the City Hall and private donors, had it rebuilt. Once the sisters took up residence in it and the chapel was opened, the Divine Mercy worship started anew there. In the Jubilee Year (2000) Archbishop Stanisław Wielgus raised the chapel to the rank of the diocesan Shrine of the Divine Mercy. It has become a place where Mercy is proclaimed and entreated for the world and where many people from Poland and abroad journey to as pilgrims. Today a church for the Shrine, adequate facilities for pilgrims, for the formation of Apostles of the Divine Mercy and for work of mercy for those in need of moral help are planned to be built in place where Saint Faustina had the revelations. ‚Divine Mercy Newsletter’, no. 66 (2008), pp 10-11. In 1930, when Sister Faustina was staying in Płock, she was sent to this house for some time. It is known that, among other things, she decorated the chapel – she stood in for Sr Thecla as regards this duty. In her ‚Diary’ she wrote: ‚One day, I had picked the prettiest roses to decorate the room of a certain person. When I was approaching the porch, I saw Jesus standing there. In a kindly way He asked me: „My daughter, to whom are you taking these flowers?” My silence was my reply to the Lord, because I recognized immediately that I had a very subtle attachment to this person, which I had not noticed before. Suddenly Jesus disappeared. At the same moment I threw the flowers on the ground and went before the Blessed Sacrament, my heart filled with gratitude for the grace of knowing myself’ (Diary 71). The village of Biała is situated 10 km from Płock. It was there that in 1928 the Congregation bought 45 ha of poor land along with devastated buildings in order to create farm facilities for the convent and the ‚Guardian Angel’ institute in Płock. A year later the refurbished building and the chapel were blessed and became a branch of the convent in Płock. The sisters took up residence in it – along with their wards they ran the farm and they also supplied crops, milk, meat and vegetables to Płock. 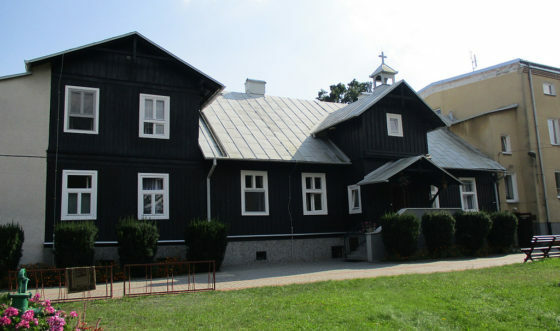 After the communist authorities closed down the convent and ‚Guardian Angel’ Institute in Płock, on the 22nd June, 1950, the sisters were moved to Biała. In that year, the land which belonged to the Congregation in Biała was also nationalised – apart from a small part of the property and the buildings. Therefore, the house in Biała, in which with time a single mothers’ home was established, became a separate convent (a new building). The railway station, the convent of the Congregation at 9/11 Św. 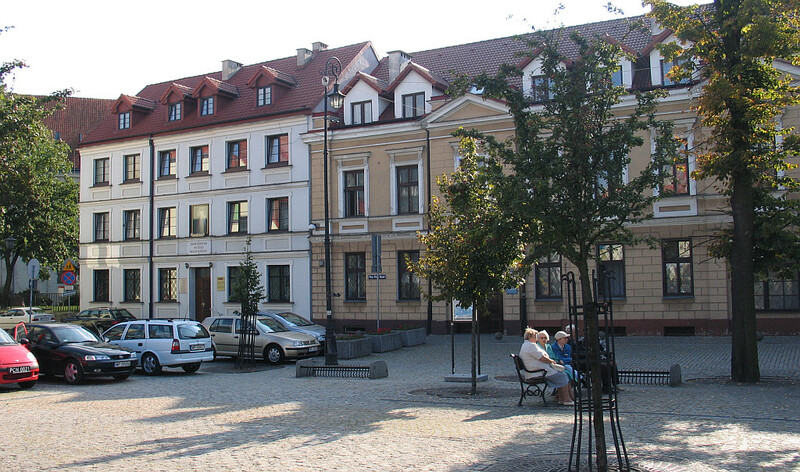 Barbary Street and Jasna Góra – these are the places in Częstochowa which were touched by Saint Faustina’s feet. For the first time she went there after making her perpetual vows, when she was going from Cracow to Vilnius. It was towards the end of May, in 1933. 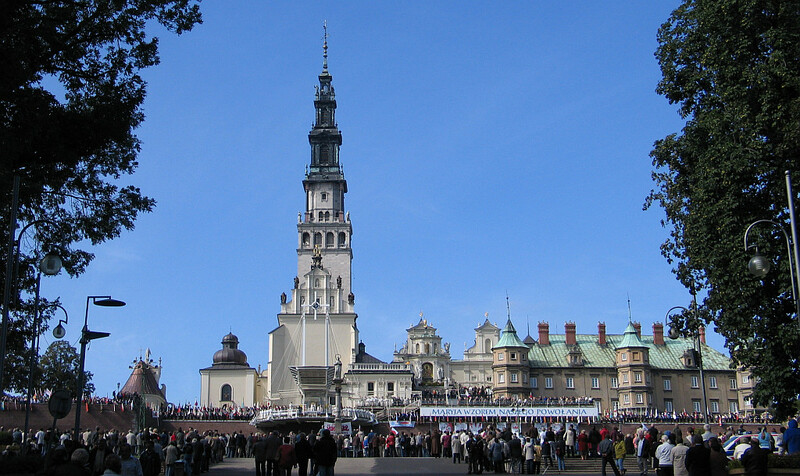 She noted down in her ‚Diary’: ‚I had permission to visit Częstochowa while on my journey. I saw the Mother of God [image] for the first time, when I went to attend the unveiling of the image at five in the morning. I prayed without interruption until eleven, and it seemed to me that I had just come. The Superior of the house there [Mother Serafin] sent a sister for me, to tell me to come for breakfast and said she was worried that I would miss my train. The Mother of God told me many things. I entrusted my perpetual vows to Her. I felt that I was her child and that She was my Mother. She did not refuse any of my requests (Diary 260). For the second time Sister Faustina came there at the beginning of November, in 1935, when, after retreat in Cracow, she was coming back with Sr Antonina to Vilnius. She did not write a lot about this stay – she only noted down that it was on Saturday and that she had prayed before the miraculous image of Our Lady in Jasna Góra. 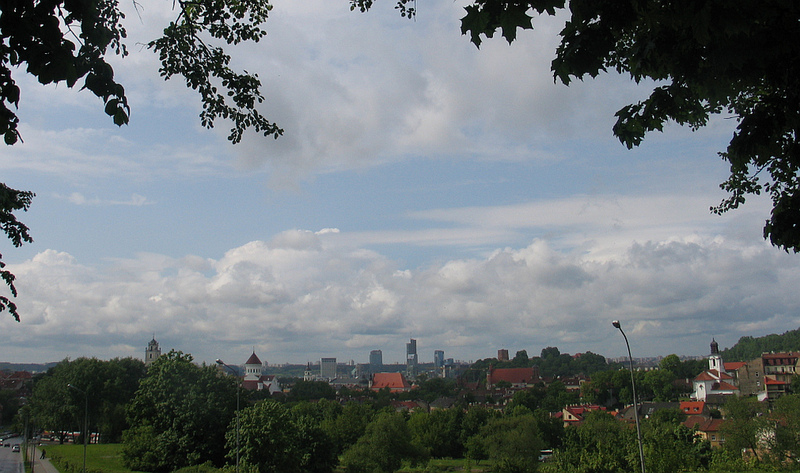 Most probably Częstochowa dates back to the 11th century. In 1370-1393 it was a fief of Władysław Opolczyk, who, in 1382, founded a monastery of the Pauline Fathers. Due the peripheral situation of the Jasna Góra monastery and the fact that it was harassed by raids, the kings of the Vasa dynasty (who were especially fond of the Częstochowa monastery) decided to have modern fortifications with bastions built around it, which made Jasna Góra one of stronger fortresses of the Kingdom of Poland. Jasna Góra became famous for its victory during the Swedish Deluge when a small garrison of the monastery under Fr Augustyn Kordecki, although outnumbered by the Swedish army, repelled the attacks. The devotion to Our Lady in Jasna Góra constantly grew, therefore, for centuries Częstochowa has been deemed the spiritual capital of Poland. At the foot of Jasna Góra, 9/11 Św. Barbary Street, there is a convent of the Congregation of Our Lady of Mercy. It is there that since 1908 the sisters ran ‚Our Lady’s Care Institute’ for girls in need of moral renewal and, with time, a small hotel for pilgrims. During the Second World War the sisters were displaced and after the war they had the destroyed chapel and other buildings reconstructed. 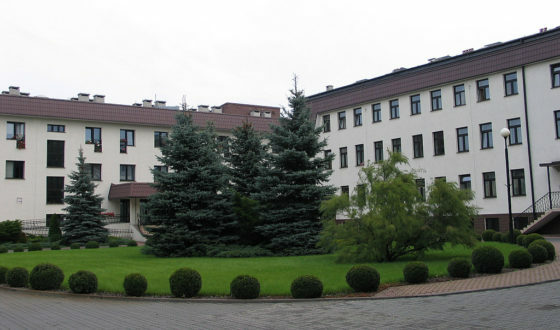 During communism (1955) the educational institute for girls was converted into the Institute for the Treatment and Education of mentally retarded boys and girls, where they as well as mentally handicapped children from Częstochowa attended a primary school which had been set up on the premises of the institute. Following Saint Faustina’s tracks we are arriving in Vilnius. In the February of 1929 Sister Faustina came to this beautiful city for the first time – for four months she was to substitute for a sister who was working in the kitchen and who was going for her third probation. Later, in May, 1933, she was sent there to work in the garden. The second stay lasted almost three years and was extremely important to the Apostle of the Divine Mercy – not only to her spiritual life but also to her mission: it was there that she met her confessor, Rev. Michael Sopoćko, who was the help that God had promised to her and it was there that Jesus gave her important tasks. The first historical note on Vilnius dates back to the year 1323: the founder of the Grand Duchy of Lithuania – Gediminas – had a wooden castle built and he moved the capital there, which used to be in Trakai. The time when King Sigismund I the Old and, later, King Sigismund II Augustus ruled was the greatest period in the history of the city. It is then that a mint, an arsenal, mills, a bridge over the Vilnia River, a numerous hospitals and palaces were built and it is then that Italian architects and sculptors (Giovanni Cini, Gianmaria Padovano) worked in the city. Vilnius became a city of many nationalities (Lithuanian, Polish, Ruthenian, Jewish, German, Italian, Armenian and Tatar). In 1579 King Stephen Báthory established an academy run by the Jesuits, which was later to become Vilnius University. The Sisters settled in Vilnius thanks to the kindness of Princess Maria Radziwiłł, Michał Radziwiłł’s wife. 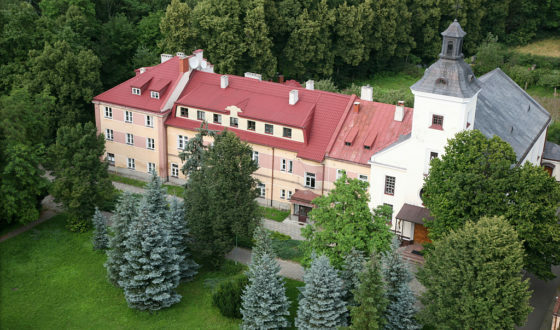 It is interesting how the place for the convent of the Congregation was chosen: Princess Radziwiłł sent her proxy, Anna Kulesza, to Vilnius so that she would choose and purchase a property. Because she wanted to carry out the duty diligently, when she could not decide which of two places to chose, she started a novena to the Lord Jesus asking Him for a visible sign that would show her which one was to be chosen. During the first days when she prayed she had an unusual dream: she saw herself praying before the miraculous statue of Jesus in St Peter and St Paul’s church. At one moment she noticed that the Lord Jesus left the church, lead her along Senatorska Street and stopped, pointing with his finger to the property of a Russian general, Bykowski. Ms Kulesza, assured by a parish priest that the dream could have been the sign she had waited and asked the Lord for, without delay, on the 16th February, 1908, purchased the property for the Congregation of the Sisters of Our Lady of Mercy. It was in Antakalnis, a district of Vilnius which is one of the oldest inhabited parts of the city. Antakalnis was famous for magnificent mansions that belonged to rich and powerful, among which Sapieha or Słuszka families are worth-mentioning. 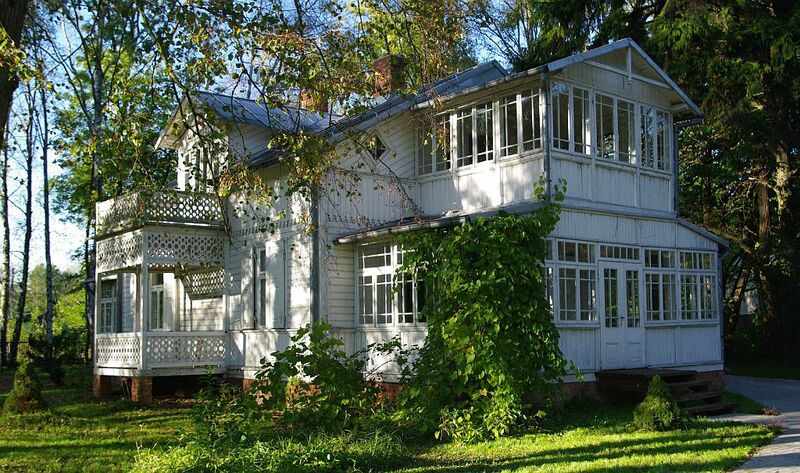 As early as in May, 1908, sisters moved into the purchased house at 25 Senatorska (today 29 Grybo) Street and they started to adapt it for the needs of an institute for penitent girls and women. As early as a year later there were over twenty wards in the house. The sisters and the wards made a modest living thanks to a laundry, bakery and embroidery workshop. The number of penitent girls and women was growing rapidly; during certain periods there were as many as sixty of them. At the same time the house always contended with financial problems. The conditions deteriorated when the First World War broke out because there was much less gainful employment. Besides, one of the dwelling houses burnt down and the congregation managed to have it rebuilt only in 1928. The conditions in the house in Vilnius improved during the interwar years. The foundation had a few modest buildings, including: a chapel, workshops as well as flats for the sisters and about ninety wards. The house made a living thanks to baking bread, washing linen for a military hospital as well as cultivating a garden and a farm which had a few hectares. However, it started having difficulties again during the Second World War and they were maybe even more serious: In 1940 the authorities nationalised the institute. The sisters were in Lukiškės Prison and, later, they found jobs in hospitals or at some private persons’ houses, also outside Vilnius (Valakampiai). In 1946 the house of the Congregation was closed down and the last sisters returned to Poland (as repatriates). It was precisely during the few peaceful interwar years that Saint Faustina came to the house in Vilnius. Her second stay in Antakalnis turned out to be especially important. On the 27th May, 1933, having just made her perpetual vows, she came there in order to be a gardener. As she wrote down in the ‚Diary’, the buildings of the convent in Vilnius seemed to be ‚tiny huts’ compared to the edifices in Cracow. A wooden cottage house was the poorest; there were the sisters’ bedrooms and – with a separate entrance from the other side, the chaplain’s flat. The new duty, which she had not carried out before, presented a real challenge to Sister Faustina, however, she trustingly relied on God’s help as well as on kind people’s advice. The fulfilment of the mission entrusted to her by Jesus was a greater trouble to her. She waited for the priest who Jesus had promised her and who was to help her carry out the entrusted mission. Rev. Michael Sopoćko, the weekly confessor of the sisters in Antakalnis at that time, turned out to be the priest. At first Rev. Sopoćko was surprised by what Sister Faustina had told him, he disbelieved her. Finally, he put her to some tests which cost her a lot. He also sought Mother Irene Krzyżanowska’s advice: he asked her about Sister Faustina’s life and requested the superior to have Sister Faustina’s mental and physical health examined. Only when the opinions turned out in Sister Faustina’s favour, and when Dr Helena Maciejewska stated that she was in good mental health, did Rev. Sopoćko become involved in painting the Merciful Jesus’ image – he did it because he was curious rather than convinced. After the task was carried out, the Lord Jesus gave Sister Faustina another one. On the day of the Feast of the Pentecost, the 9th June, 1935, He revealed another assignment to her – when she was in the garden she heard: ‚By your entreaties, you and your companions shall obtain mercy for yourselves and for the world’. At first she was not sure if she had understood the Lord Jesus’ words well. The idea of founding a new congregation frightened Sister Faustina; the time of her many sufferings and passive nights of the spirit commenced. At the same time, at her confessor, superiors and Archbishop Romuald Jałbrzykowki’s command she was to wait. Only towards the end of her life did she understand that the Lord Jesus did not mean just one religious congregation which would proclaim and beg for mercy but that He meant a movement in the Church which would embrace active and contemplative orders, priests and a multitude of lay people. Today we know that the revelation in Vilnius was the beginning of the Apostolic Movement of the Divine Mercy, which is present in the whole world already. In the house in Vilnius also another event took place, thanks to which the Lord Jesus endowed us with a prayer to be said in order to appease the anger of God. On Friday, the 13th September, 1935, Sister Faustina had a vision in her room: she saw an Angel who came in order to punish the earth. She started to pray fervently, however, standing before the Majesty of God she did not dare to repeat the entreaty in order to avert the punishment. Then she found herself praying with words heard interiorly and she saw the Angel’s helplessness. The next day the Lord Jesus taught her how to say the prayer, which we call the Chaplet to the Divine Mercy, and, soon afterwards He told Sister Faustina about the great promises He attached to saying the prayer with trust. During her stay in the house in Vilnius on some occasion Sister Faustina may have visited the gorgeous baroque parish church dedicated to Saint Peter and Paul, which was built in 1668 – 1675. It was founded by a grand hetman of Lithuania, Michał Kazimierz Pac, and it was a votive offering for saving his life during Lubomirski’s Rebellion. The building, in which there are about 2000 sculptures made by leading Italian artists – Pietro Perti and Giovanni Galli, as well as paintings by Michelangelo Palloni, was designed by Jan Zaor of Cracow. It is one of the most beautiful churches in Vilnius and it cannot be ignored when one follows Saint Faustina’s tracks in this city. Following Saint Faustina we are continuing our trip in Vilnius. From Antakalnis, where the convent of the Congregation of the Sisters of Our Lady of Mercy was, we are going to the city centre in order to visit places connected with the stay of the Apostle of the Divine Mercy and with the work entrusted to her by Jesus. First, we are bending our steps towards 6 Rasų Street, where, under Sister Faustina’s supervision, the first image of the Merciful Jesus was painted. – We are going to the building which was the chaplaincy of the Sisters of the Visitation convent as well as of the Sacred Heart’s Church. In the thirties of the 20th century Rev. Michael Sopoćko and Eugene Kazimirowski lived there: the former on the first floor and the latter on the ground floor. During the post-war years the building was part of a prison complex and today it is inhabited by the Sisters of the Merciful Jesus. Rev. Michael Sopoćko was curious to see what the Lord Jesus’ image according to Sister Faustina’s vision would look like and he asked precisely Eugene Kazimirowski to paint it. The painter, who was known in the Vilnius circle, had studied in the studios of Łuszczkiewicz, Axentowicz and Wyczółkowski in Cracow. He also studied in Lvov, Munich and Paris. In 1900, in St Luke’s Academy in Rome, he completed his education as a painter and after 1914 he became permanently connected with Vilnius. For many years he taught in a teacher training college, he was a scene designer, and a board member of the Vilnius Society of Independent Visual Arts Artists. He painted landscapes and portraits mostly, however, he also created religious pictures. The Merciful Jesus’ image started to be painted in January, 1934, and the work was done very discreetly. As superior Mother Irene Krzyżanowska recalled: ‚In order not to attract the sisters’ attention as regards Sister Faustina’s inner experiences, every Saturday morning I went with her to Ostra Brama in order to attend Holy Mass and after this we paid the painter a short visit – Sister Faustina provided him with detailed information about how he should paint the image of the Merciful Jesus.’ In June, 1934, the Image of the Merciful Jesus was finished; however, Sister Faustina was not pleased with it. She complained to Jesus: ‚Who will paint You as beautiful as you are?’ And she heard the following response: ‚Not in the beauty of the colour, nor of the brush lies the greatness of this image, but in My grace’ (Diary 313). At first, Rev. Sopoćko put this image in the corridor of the Bernardine [Observant] Sisters, next to Saint Michael’s Church. 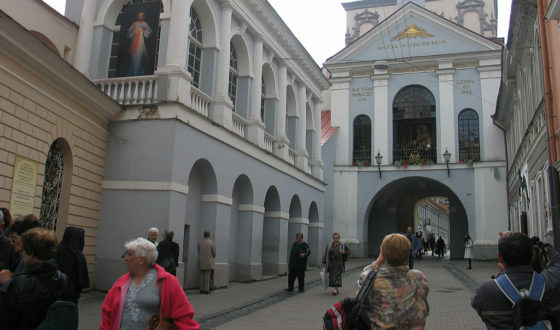 However, during the Holy Week of 1935, Sister Faustina firmly said that the Lord Jesus demanded that His image be displayed in Ostra Brama [the ‚Gate of Dawn’ to the city of Vilnius] during the Triduum marking the Jubilee Year of the Redemption of the World. Rev. Sopoćko recalled: ‚Soon after I came to know that the Triduum would take place and the parish priest of Ostra Brama, Canon St. Zawadzki, asked me to deliver a sermon. I agreed to do that on condition that the image be put up to decorate the window of the arcade, where it looked impressive and drew everybody’s attention more than the picture of Our Lady’. Sister Faustina was delighted seeing that Jesus’ wishes had come true: the image was publicly honoured – precisely on the day which He had chosen to be the Feast of Mercy. When Rev. Sopoćko was giving a sermon about the greatest of God’s attributes, she herself saw that in the picture Jesus came alive and His rays pierced the hearts of the people that had come to take part in the ceremony. In March, 1936, Sister Faustina left Vilnius for good, however, Rev. Sopoćko continued her mission in the city. By every possible means he tried to propagate the devotion to the Divine Mercy and he also broadened his theological knowledge of the mystery. Therefore, in Vilnius there are places which are not so much connected with Sister Faustina herself as with the mission entrusted to her by the Lord Jesus. Saint Michael the Archangel’s Church is worth-mentioning because it was there that the image of the Merciful Jesus hung since 1937 till 1948 – the year when the church was closed down. In place of the church and the Bernardine Sisters’ convent there used to be a medieval palace of the Sapiecha family. Lew Sapiecha, who was a grand hetman [the second highest military commander] of Lithuania and a governor of Vilnius province, donated the palace to the Bernardine Sisters and adapted it for the needs of the convent. In 1594-1596 he had Saint Michael the Archangel’s Church built next to the palace. In 1933 the church and the convent were renovated. However, unfortunately, in 1948 the church was closed down and since 1956 it has been a museum of architecture. In November, 1932, Sister Faustina left Płock in order to go to Warsaw – she was going there for her ‚third probation’ – the time of direct preparation for perpetual vows. The superiors sent her to Walendów so that she would make an eight-day retreat before starting that stage of her formation. The retreat was preached by Fr Edmund Elter, an enlightened priest who was the first person to assure her that she was on the right path, that her revelations came from God and that God Himself was entrusting her with a great mission. Having made the eight-day retreat Sister Faustina left Walendów and toward the end of March, 1936, she came to that place for a second time, for a few weeks. In 1896 Count Gustaw Przeździecki presented the Congregation of the Sisters of Our Lady of Mercy with a grange in Walendów. It encompassed quite some land, ponds, mills, farm facilities and a dwelling house. Since the grange was taken over by the Congregation a few sisters who tended to the farm stayed in it permanently. They were helped by the grange servants, whose salaries were paid by the superior of neighbouring Derdy. In 1908 an institute for girls and a house of the Congregation started to be built, however, the sisters moved into the house only in April of 1913, having left Derdy. During the First World War the farm was destroyed completely, however, the institute was still opened; in 1920 over sixty wards stayed there. The Congregation built a spacious chapel for the needs of the institute and the grange. Actually, it was a church which was consecrated by Archbishop Stanisław Gall on the 12th September, 1934. In March of 1936 a penitentiary agricultural colony was established in Walendów: women aged 18-30 who had been sentenced to imprisonment stayed there – the Ministry of Justice wanted to protect them from a bad influence of recidivists as well as give them an opportunity to lead a normal life again. Their daily timetable included work, education and rest. As far as their education is concerned, they learnt reading, writing, hygiene and handiwork. They also did housework and, during spring and summer, they helped in the farm, orchard as well as in the apiary. The women had fairly a lot of freedom; they could develop their intellect and bodies. Religious instruction as well as participation in religious practices played quite an important part in their education. Due to the outbreak of World War II the colony ceased working, however, as early as in 1940 some women were sent there by prison authorities from Warsaw. Since 1944 the invaders sent minors to Walendów – they were girls who had been sentenced to youth detention centre. During the war the sisters joined other people in helping refugees. On the institute’s premises they hid many persons, also of Jewish descent. During the Warsaw Uprising for two months they visited the Nazi temporary camp in Pruszków in order to get out of it whoever they could and they also brought food and clothes there. At that time there were a large number of refugees in the institute and, therefore, it was impossible to work in it. The sisters have never managed to run the house of mercy for girls fully again. 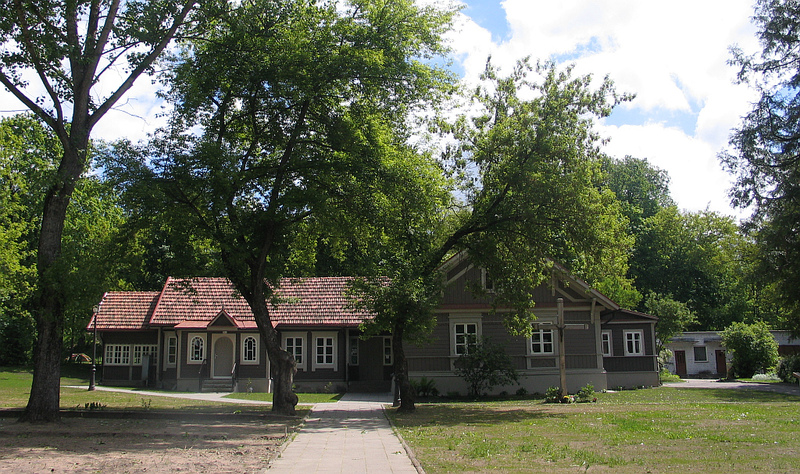 – In March of 1950 the property in Walendów was taken over by the state Treasury and the centre was transformed into the Special Institute for Mentally Handicapped Women, who were taken care of by the sisters’ right up until 2006. Today in Walendów there is a children’s home run by families – children and teenagers experience caring love there and prepare themselves for independent life. In historical terms, Derdy is the third house of the Congregation in Poland. 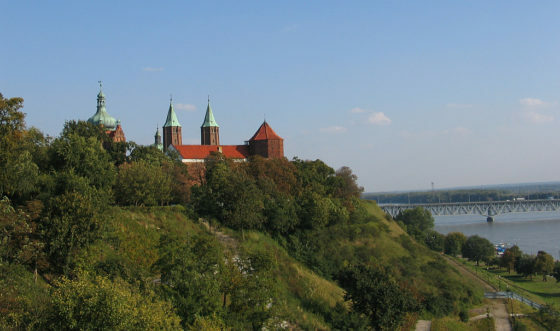 It is situated a dozen or so kilometres from Warsaw, in a sandy place surrounded by forests which Sister Faustina described in her letter to Rev. Michael Sopoćko, dated 10th May, 1936: ‚Our little house in Derdy is really like out of a fairytale. It is surrounded by woods, there aren’t any buildings nearby. Peace and quiet. Everything helps the spirit to be recollected; birds are breaking the silence and chirping their adoration of the Creator. I can see God in everything that surrounds me.’ The land in Derdy was given to the Congregation by Countess Maria Przeździecka, née Tyzenhauz. In the December of 1881 the sisters came there and they called the new institute ‚St Joseph’s Care Home’. Mother Aniela Popławska became the superior. At first Derdy was supposed to be a holiday home for sisters and wards from the house in Warsaw, however, soon the sisters in Derdy became independent and started to run a discrete house of mercy. In the beginning twenty wards stayed in it and in 1906 there were as many as ninety of them. The sisters had to leave Derdy in 1913 and, together with the girls, they moved to Walendów. At the invitation of Duchess Zofia Świętopełk-Czetwertyńska they came back to Derdy in 1932. The sisters were faced with the task of having the buildings renovated as they had been damaged during the war. As early as two years later it was already possible to have the chapel consecrated. From time to time Holy Mass was celebrated there by a chaplain from Walendów or by the parish priest of Magdalenka. At that time Derdy was a branch of the house in Walendów and the sisters ran a house of mercy for younger girls – they were provided with primary education. Until 1938 the institute admitted girls at the request of individual people and later there were also girls sent by the Social Welfare of Warsaw. After World War II, which was a very difficult period in the history of the house, Derdy suffered the fate of Walendów. In 1950 the farm was nationalised and the institute was converted into a mentally handicapped girl’s special centre. After the institute was closed down in 1995, the Congregation opened the playgroup Jutrzenka [the Morning Star] and, in 1999, the retreat house Miłosierdzie [Mercy]. ‚Divine Mercy Newsletter’, no. 70 (2009), pp10-11. On 29th July, 1937, Sister Faustina arrived at Rabka. She stayed in this house of the Congregation until 10th August, 1937, which means: for less than a fortnight only. The microclimate of Rabka, which has been beneficial to so many people, did not agree with Sister Faustina. ‚I feel so unwell here, however, that I am obliged to stay in bed’ – she noted down in her ‚Diary’ (Diary 1201). There is one interesting episode connected with her stay in the health resort – she wrote about it in her ‚Diary’: ‚Saint Joseph urged me to have a constant devotion to him. He himself told me to recite three prayers [the Our Father, Hail Mary and Glory be] and the „Memorare” once every day. He looked at me with great kindness and gave me to know how much he is supporting this work [of mercy]. He has promised to me this special help and protection. I recite the requested prayers every day and feel his special protection’ (Diary 1203). A plaque at the entrance to the convent commemorates Sister Faustina’s sojourn in Rabka and today, still there is also the room in which she stayed. Rabka is a famous health resort. Its brine springs were known as early as in the 13th century, when Rabka was situated in the lands of Cistercians and the brines were probably used for the needs of the monastery. Some research done in 1858 showed that they are one of the strongest iodine-bromide brines in Europe. Therefore, as early as in 1864 the first Curative-Bathing Institute and, eight years later, the Institute for the Treatment of Children were opened. The specific microclimate and curative waters made Rabka develop rapidly, especially as a health resort where respiratory and circulatory systems conditions as well as tuberculosis were treated. For these reasons Saint Faustina also came to Rabka. She stayed at the house of the Congregation at 12 Słowackiego Street. – Since 1931 it had been a holiday place for the sisters and wards, however, after a short time, it had also become a place where children were taken care of. At first ‚Loretto’ house in Rabka was a branch of the convent in Cracow. During World War II the sisters were displaced from ‚Loretto’ by the Germans. However, in 1945 they returned to the house and established a children’s home in it – for twenty girls. In 1962 the children’s home was closed down and since 1946 ‚Loretto’ has been an independent house of the Congregation. Today the sisters run a playgroup in it.